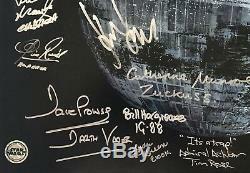 THIS LISTING IS FOR A INCREDIBLE STAR WARS PHOTO OF THE HALF BUILT DEATH STAR WHICH HAS BEEN AUTOGRAPHED BY 23 CAST MEMBERS FROM THE ORIGINAL STAR WARS TRILOGY. THIS HIGH QUALITY MATTE FINISH LARGE PHOTOGRAPH MEASURES 16x20 INCHES AND IS PERFECT FOR FRAMING AND DISPLAY. 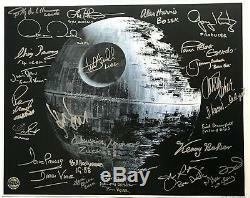 THIS IS A OFFICIALLY LICENSED PROFESSIONAL QUALITY STAR WARS PHOTO. THE STAR WARS HOLOGRAM DECAL IS AFFIXED ON THE CORNER. 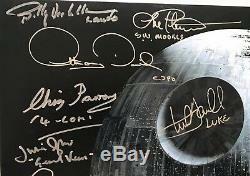 THE FOLLOWING HAVE SIGNED: HARRISON FORD (HAN SOLO), MARK HAMILL (LUKE SKYWALKER), CARRIE FISHER (PRINCESS LEIA), KENNY BAKER (R2-D2), ANTHONY DANIELS (C3-PO), PETER MAYHEW (CHEWBACCA) DAVID PROWSE (DARTH VADER), BILLY DEE WILLIAMS (LANDO), GARY KURTZ (PRODUCER), JEREMY BULLOCH (BOBA FETT) PAUL BLAKE (GREEDO) TIM ROSE (ADMIRAL ACKBAR) ERIK BAUERSFELD (VOICE OF ADMIRAL ACKBAR), JOHN RATZENBERGER OF CHEERS (MAJOR BREN DENLIN) JULIAN GLOVER (VEERS) CLIVE REVILL (EMPORER) ALAN HARRIS (BOSSK) BILL HARGRAVES (I-88) CAROLINE MUNROE (ZUCKUSS) CHRIS PARSONS (4 LOM) MIKE EDMONDS (LOGRAY & UGNAUGHT) LYDIA GREEN (EWOK) LORNE PETERSON (SFX). 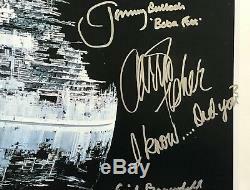 CARRIR FISHER WROTE I KNOW... 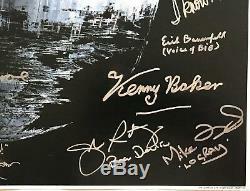 THIS PHOTO WAS SIGNED IN PERSON OVER A FOUR YEAR PERIOD BETWEEN 2014 AND 2017 AT SIGNINGS AND EVENTS. 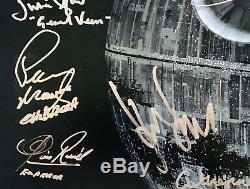 SADLY, IT IS NOW IMPOSSIBLE TO OBTAIN THIS COMBINATION OF ORIGINAL STAR WARS TRILOGY CAST MEMBERS AS THREE HAVE PASSED AWAY. 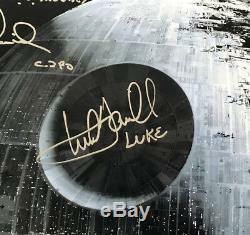 THE FOLLOWING ARE MOST OF THE EVENTS THAT THIS PHOTO HAS BEEN SIGNED AT: 2015 STAR WARS CELEBRATION IN ANAHEIM, 2014 LONDON FILM AND COMIC CON, 2015 INDY CON, 2015 & 2017 LEXINGTON CON, 2017 GRAND RAPIDS CON. 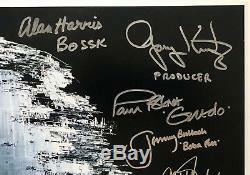 HARRISON FORD SIGNED THIS PHOTO IN NEW YORK WHILE IN THE CITY FOR BLADE RUNNER 2049 MOVIE MEDIA APPEARANCES ON SEPTEMBER 27TH, 2017. 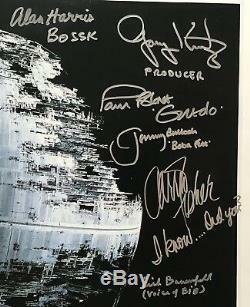 CARRIE FISHER SIGNED AT THE 2015 INDY CON. 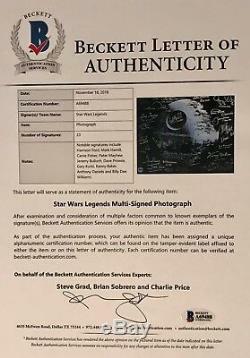 A (LOA) FROM THE BECKETT AUTHENTICATION COMPANY (STEVE GRAD OF PAWN STARS) WILL COME WITH THIS SIGNED PHOTO. 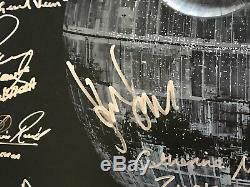 The item "Star Wars cast signed Photo harrison ford carrie fisher mark hamill beckett psa" is in sale since Saturday, November 24, 2018. This item is in the category "Entertainment Memorabilia\Autographs-Original\Movies\Other Orig. The seller is "inkster_sports" and is located in Oak Creek, Wisconsin. This item can be shipped worldwide.